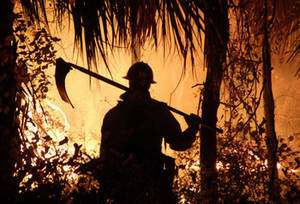 Description: This is a free picture of a silhouette of a Civil Engineer Squadron worker combating a wildfire. The photo was taken May 15, 2007 in Florida. Public domain image by the Air Force through the Department of Defense.